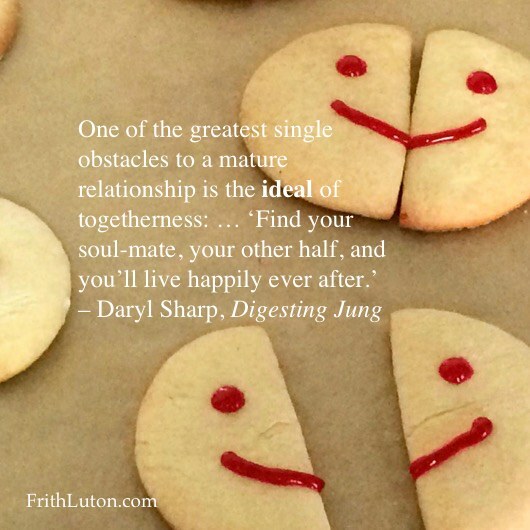 One of the greatest single obstacles to a mature relationship is the ideal of togetherness. It is an ideal based on the archetypal motif of wholeness. Find your soul-mate, your other half, and you’ll live happily ever after. This is a very old idea. You find it in Greek philosophy, for instance in Plato’s Symposium, where Aristophanes pictures humans as originally whole but arrogant. As punishment, Zeus cut them in half, and now, it is said, we forever seek to replace our lost other. There is nothing intrinsically wrong with this ideal. The mistake is in expecting to find our “lost other” in the outside world. In fact, it is our contra-sexual inner other, animus or anima, who is more properly the object of our search. Outer relationships, already hampered by personal complexes and a multitude of day-to-day concerns, cannot bear the extra weight of archetypal expectations. Although individuation is not possible without relationship, it is not compatible with togetherness. Individuation, finding your own unique path, requires a focus on the inner axis, ego to unconscious—getting to know yourself. The ideal of togetherness lets you off that hook. Togetherness doesn’t acknowledge the natural boundaries between people, and it gives short shrift to their differences. All you’re left with is unconscious identity. When you are on the path of individuation, focused on your own psychological development, you relate to others from a position of personal integrity. This is the basis for intimacy with distance. It is not as sentimental as togetherness, but it’s not as sticky either. A relationship based on intimacy with distance does not require separate living quarters. Intimacy with distance means psychological separation, which comes about through the process of differentiation—knowing where you end and the other begins. Intimacy with distance can be as close and as warm as you want, and it’s psychologically clean. Togetherness is simply fusion, the submersion of two individualities into one, variously called symbiosis, identification, participation mystique. It can feel good for a while but in the long run it does not work. Togetherness is to intimacy with distance as being in love is to loving. When you’re in love, you absolutely need the other. This is symptomatic of bonding, which is natural between parent and infant, and also at the beginning of any relationship at any age. But need, finally, is not compatible with loving; it only shows the degree to which one lacks personal resources. Better take your need to a therapist than dump it on the one you love. Need in an intimate relationship easily becomes the rationale for power, leading to the fear of loss on one hand, and resentment on the other. The key to intimacy with distance is the self-containment of each of the partners, which in turn depends on how much they know about themselves. When you are self-contained, psychologically independent, you don’t look to another person for completion. You don’t identify with others and you’re not victimised by their projections. You know where you stand and you live by your personal truth—come what may. You can survive cold shoulders and you can take the heat. When you are self-contained, you have your own sacred space, your own temenos. You might invite someone in, but you’re not driven to, and you don’t feel abandoned if the invitation is declined. You respect the loved ones’ boundaries, their freedom and privacy, even their secrets; you give them space and you don’t knowingly push their buttons. You don’t judge and you don’t blame. There is interest in, and empathy for, the concerns of others, but you don’t take them on as your own. When you are psychologically separate, not identified with your mate, you don’t need the other to agree with you and you don’t need to be right. You don’t expect the other to change in order to suit your needs, and you don’t ask it of yourself either. And if over time you can’t accept the other but still can’t leave, well, that is the stuff of analysis: conflict and complexes. The bond between two people is a precious and mysterious thing, not entirely explained by the theory of complexes and the phenomenon of projection. But this much at least is true: there is an optimum distance in every relationship that evolves through trial and error and good will—if you know who you are and can stop pressing for more than you get.